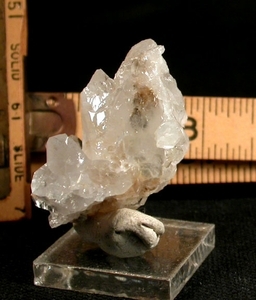 For big treats in thumbnail size, this Arkansas quartz cluster is a fine contender: a rare blue phantom and a blue inclusion [black manganese] clearly show in a side of elestial growth; THREE very rare 8h faced crystals; a vine of rare faden veils. Rainbows and strategically placed pale iron oxide inclusions add spice. 1-1/4"x 1-1/2"x 1-1/4" tall, self-displays brightly. Sent gift boxed with hand written description on our enclosure card. Shipping will be added.